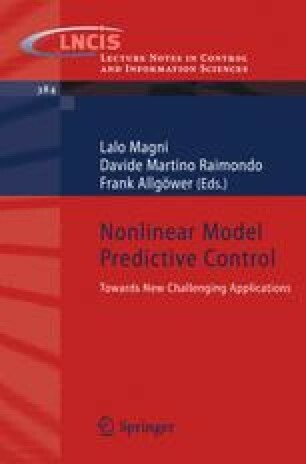 This paper deals with the tracking problem for constrained nonlinear systems using a model predictive control (MPC) law. MPC provides a control law suitable for regulating constrained linear and nonlinear systems to a given target steady state. However, when the target operating point changes, the feasibility of the controller may be lost and the controller fails to track the reference. In this paper, a novel MPC for tracking changing constant references is presented. This controller extend a recently presented MPC for tracking for constrained linear systems to the nonlinear case. The main characteristics of this controller are: considering an artificial steady state as a decision variable, minimizing a cost that penalizes the error with the artificial steady state, adding to the cost function an additional term that penalizes the deviation between the artificial steady state and the target steady state (the so-called offset cost function) and considering an invariant set for tracking as extended terminal constraint. The properties of this controller has been tested on a constrained CSTR simulation model.